When I was younger, this book was lying around my house. My bother Sean had bought it from the school book fair. It managed to follow us around as we moved houses and States. From Wikipedia; Snow Treasure is a children’s novel by Marie McSwigan. 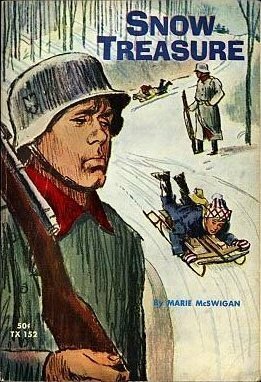 Set in Nazi-occupied Norway during World War II it recounts the story of several Norwegian children who use sleds to smuggle their country’s gold bullion past German guards to a waiting ship. Published in 1942, it has been in print ever since.The book was made into a movie of the same name in 1968, directed by Irving Jacoby. In truth, I have not ever read this book, but I will. This book was on my mind a lot during my recent trip to Norway. One of the first things I did when I got home (NO, it was not unpack my skis which sat on top of my dining room table for what will remain an “undisclosed amount of time,”) was to order this book online. Published continuously since 1942, I had to own the book published with this exact cover as many publishing’s had different art. A used copy was found in England, and shipped to me. I’m not sure if the word “haunt” can be used as a positive emotion, but haunt is exactly what the cover art of this book does to me. Anyway, it’s the other half of the cover art that really gets me. I completely “find myself inside” the sled ride. I feel the acceleration of the downhill run, the outboard centrifugal force as the first kid turns left, the hardness of the sled wood against my chest, the strain of my neck as I look up, the tingle of my feet as they hang high like an airplanes tail wing, and the cool air being sucked into my lungs. As if that’s not enough to mention, add the euphoria of any long-winding, snow-covered slippery run that any kid who ever climbed a hill with sled in hand knows, but will never have to explain it to another person with a sled; be it an Olympic bobsled run, or the little 3 foot high “sledding mountain” we first rode down as young kids. That’s the power of art, and while we’re at it, the power of sledding. I read this book! I LOVED this book! But more than the story, I was drawn to the cover art. It made the book more visual, and therefore, more understandable for me. (Visual learner, what can I say??) But unlike those crazy New Englanders that love and embrace the cold of winter, it made me a child of Kona. We can’t ALL go to the Arctic Circle for vacation, thank God! ZD – thank you for the shout-out! And now I want to read this book, too. Sounds like a great book. Let us know what you think when you have read it . . .